Doctor Who: Big Finish - The First Doctor Companion Chronicles Box Set Vol 1 Review | Warped Factor - Words in the Key of Geek. Fascinating. Hm, yes, fascinating, says Tony Fyler. Big Finish should know a thing or two by now about delivering interesting, time-appropriate companion chronicle stories for a range of Doctors – the company did it for years before announcing that the Companion Chronicle range would be retired in place of the Early Doctors range of fuller, bigger cast stories from the early years of Who. 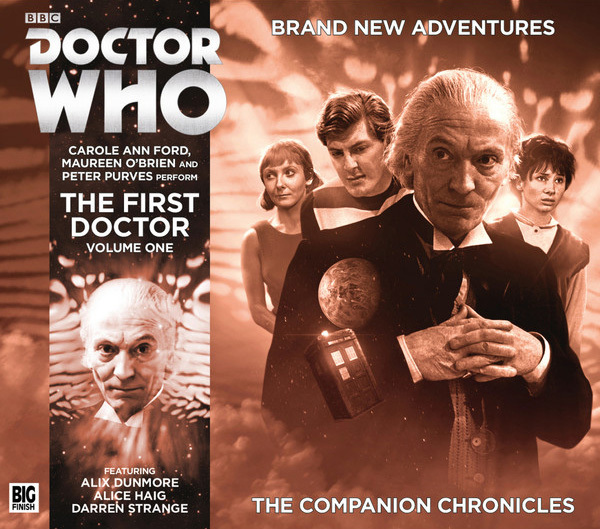 As such, this Companion box set comes as a treat, dipping us back into the format that worked so well for the company for so long – hour-long stories, with usually one or two other voices beside the main companion (and/or their version of their Doctor). There are four episodes, but technically only three stories, the last two hours being an exhilarating catch-up with an older Steven Taylor, decades after he left the Doctor to rule the planet of the Savages (a story which follows on from the previous Companion Chronicle, The War To End All Wars). So here we get a pre-Ian and Barbara Susan story of the Doctor falling ill, a Vicki story with Ian, Barbara and the Doctor all doing their silent bits, and the two-hour Steven story. If you’re a fan of the First Doctor, it’s a rare treat, the stories chosen for their delivery of a tone that feels inherently right for each of the three companions, and give a couple of treats along the way. The Susan story, which naturally and chronologically kicks us off, does all the things Susan does well – corridors, creepiness, ‘I’m scared’ and ‘I’m really very clever, look,’ – but all without the Doctor to bounce off. It’s one of those stories that tries to fix the damage of 60s audience expectations and give Susan the otherworldy capability that was apparently pitched to Carol Ann Ford originally, but which mostly failed to materialise in the transmitted show. Not a lot of screaming or ankle-twisting goes on in this story, but some quite sophisticated scientific twiddling about helps if not exactly save the day – the mood of the piece is decidedly sombre – then to give pathways to a resolution. Without the Doctor to fall back on, and without, as she sometimes did, having to demure to the ‘grown-ups’ Ian and Barbara, we see Susan in a different light, and it’s a light that makes us sure that when she’s stranded on Earth after the Dalek invasion, she will be OK. Here’s the Susan that we always suspected was there, but which practically always struggled to emerge from the storytelling strictures of the 1960s show. What else does The Sleeping Blood have to offer? Some good scuttly nastiness, a handful of body horror, a cogent debate on how restricting access to healthcare by market forces leads to desperation and a society at war with its own existence (did we mention the sombre tone?) and an uncomfortable itchy vagueness about who’s a hero and who’s a villain in a world where ‘terrorism’ is a common word. For all the ‘young’ Susan is its hero, this is Doctor Who for grown-ups, and could quite easily still have sold as a single release. The Unwinding World, the Vicki story, is the oddest of this bunch. It uses lots of clever sound and scripting tricks to create a bigger world than the one it actually shows to us in the foreground, and it delights in giving Vicki more of the natural skills her character should have had, but was seldom able to display. If The Sleeping Blood is typical of one kind of Doctor Who story, the ‘Doctor-Light’ episode, The Unwinding World is a good example of the kind of storytelling that only really existed for the first three Doctors, and that certainly had its fullest flowering in the time of the Hartnell Doctor – the sprawling, long story where each of the Tardis crew has an individual role to play, and goes about playing it pretty much independent of the others. On a world apparently enslaved, with memory the greatest gift and the greatest fear, everything is gradually getting just a little bit worse. And while the Doctor is off staging a somewhat geriatric revolution, and Ian and Barbara too are each playing their crucial roles, this is very much Vicki’s story, as she talks to a controlling computer and peels back layer after layer to try and find what really is the truth of the world. To what degree either she or the story succeeds is debatable – it certainly makes a kind of sense by the end (and that turns on one line, delivered with serious aplomb by Maureen O’Brien), but for all that, it remains quite an unnerving listen, more insidious than the scuttling body and political horror of The Sleeping Blood but perhaps just a little too preachy for its own good. While the two final stories are both ‘old Steven’ stories (he’s nearly 100 by this point in his timeline), and while there is a coherent through-line from The War To End All Wars, the two Steven episodes here could hardly be more different in their tone. The Founding Fathers takes us back to an instance mentioned on screen by the Tenth Doctor – a meeting with Benjamin Franklin, and getting electrocuted by lightning while holding on to a kite. It’s a story related by old Steven, but showing young Steven during his adventures with the Doctor, and in and of itself, it’s irresistible fun. Where it works less well is in the reason it’s being told by old Steven at all, which gets to the core of an ‘off-screen’ atrocity by something that isn’t the Doctor – but almost is. That reasoning is sold with a kind of co-incidental relevance that doesn’t entirely work as a justification for an otherwise entertaining run-in with the future founding father. It does though build on The War To End All Wars and set us up for the final story here, The Locked Room. That story borrows bits of itself from all along the Doctor’s path – most specifically Big Finish’s own Oliver Harper trilogy, but also The Tenth Planet, Circular Time, and even, in terms of a locked and lead-lined room, having a whiff of The Invasion of Time about it. It comes together in a tight story that feels honest about Steven’s disagreements with the Doctor, but also about how much he genuinely liked the old man – a realisation given additional bite now that Steven himself is older, and rather more like the Doctor than he was during his space pilot days, with a granddaughter of his own to love and be eternally challenged by. It ends on a more hopeful note than either of the two other companion chronicles here, with a kind of redemption for a Steven who had grown old in a kind of self-imposed exile. This one will make you smile at the end, as if wishing well for a friend you’ve known, who’s come in from the cold. The First Doctor Companion Box Set has a little something for most fans of the Hartnell era, digging deeper into Susan’s character before she met Ian and Barbara, giving Vicki the kind of front and centre role she could have coped with, but was seldom given, and bringing us further with Steven Taylor, who has, of the three, received probably the most comprehensive reclamation by Big Finish, having been given little in the way of actual character backstory or internal motivation during his time on the show. It’s worth getting for more than the nostalgia value: it helps see old companions in a new and, dare we say it, better way than the era of their TV life could ever afford to show them.